“For the scripture saith unto Pharaoh, Even for this same purpose have I raised thee up, that I might show My power in thee, and that My name might be declared throughout the earth” (Romans 9:17, emphasis added). And yet today, in AD 2018, there are few people who know God’s (Elohim’s – the Supreme Being’s) name. “Therefore My people shall know what My name is and what it means” (Isaiah 52:6, Amplified Version, emphasis added). “What is His [God’s - Elohim’s] name, and what is His Son’s name, if thou canst tell?” (Proverbs 30:4). Does it even matter if we know the name of God (Elohim)? Many of the Biblical authors seemed to think so and from the following you can see what is promised to those who know His name. “Because he hath set his love upon Me, therefore will I deliver him: I will set him on high, because he hath known My name” (Psalm 91:14, emphasis added). “And they that know Thy name will put their trust in Thee: for Thou, LORD [Yahuwah], hast not forsaken them that seek Thee” (Psalm 9:10, emphasis added). How can we put our trust in Someone Whose name we do not even know? What is there about that name that is so important that such great promises are made to those who know it? What does His name mean? The word translated as “God” throughout the Bible should actually have been translated as “Elohim” – meaning "the Supreme Being.” There are many false gods mentioned by name in the Bible such as Baal, Astaroth, Remphan, Chiun, Tammuz, Bel, Molech, Chemosh, Dagon and so on, but there is only One Who is "the Supreme Being” and His name is not used in the Bible except for four instances when His name is translated and not transliterated as it should have been. “And this is life eternal, that they might know Thee the only true Elohim [God], and Yahushua Messiah [Jesus Christ] Whom Thou hast sent” (John 17:3). But God and even Elohim and “the LORD” are not His names; these are some of His titles. Throughout the Old Testament God’s (Elohim’s) name was translated into English as “the LORD;” LORD being in all capital letters, except in a few places in King James Version where it was translated as “Jehovah.” But there were no “j’s” or “v’s” in the Hebrew language and the “j’s” were not in the English language until around 400 – 500 years ago. “The LORD” is not His name; that is a title. His name in the Hebrew is YHWH. 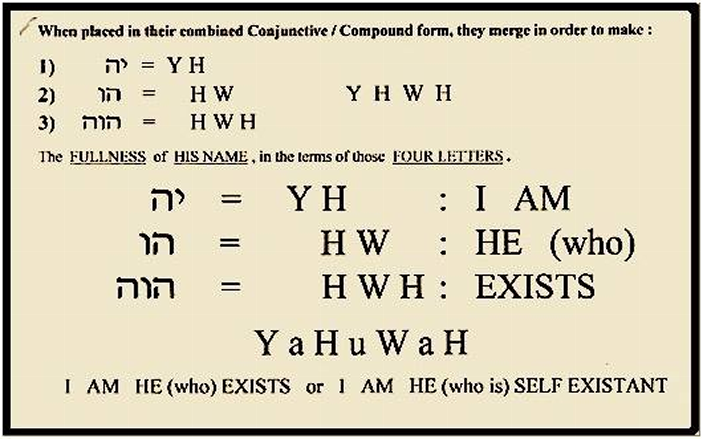 There are a number of ways in which that is written out in order to obtain the proper pronunciation, and I, not being a Hebrew scholar, can only go by the preponderance of evidence shown that His name is spelled, in order to obtain the correct pronunciation, as “YaHuWaH” which means “the eternal self-existent One” (Isaiah 52:6, Amplified Version). His titles and name have a depth of meaning not known when “God” and “the LORD” are used. Those using other spellings have their reasons for what they use also. The following will show you why I have chosen to use what I have in this matter. I will be using the Hebrew names for the Father and His Son throughout this book, and I want you to know why I am doing this. Names in one language tend to be pronounced or spoken the same in other languages. When this is done and the names are written out in order to obtain the correct pronunciation, it is referred to as transliteration. Elohim wants His people to know His name and His Son’s name and not just their titles and what they mean (Isaiah 52:6, Proverbs 30:4), and He wants the world to know also (Romans 9:17). In the place of God, I have used Elohim which properly distinguishes Him from other gods of which there are many – He being “the Supreme Being.” For His name, I have used “Yahuwah” instead of His title, “the LORD,” which is what the Biblical translators should have used. And for the only-begotten Son of Elohim, I have used Yahushua, which means “Yah saves.” In Matthew 1:21 it should state, “Thou shalt call His name Yahushua: for He shall save His people from their sins.” In the Old Testament, we have His name translated for us into English as “Joshua” which if you will reference your concordance is what the Son of Elohim’s name should have been in the New Testament also. “What is His name and what is His Son’s name?” (Proverbs 30:4). So now that you know what Elohim’s name is and what His Son’s name is, the questions in Proverbs 30:4 have been answered for you, and you now know, if you had not known before, why those are Their names. There is meaning in those names that goes unnoticed if they are not used. It is time for Elohim’s name and His Son’s name to be known “throughout the earth” (Romans 9:17). In place of “Christ,” I have used “Messiah” which means “the Anointed One.” If you will examine a concordance you will see that these changes are not only acceptable but may be preferable to what the translators used. I do not know why the translators used titles instead of the names of Elohim and His Son, but as we read from Romans 9:17, it was Elohim’s purpose to have His name known throughout the earth, and that His people should especially know Who they are worshipping and why, as indicated by Their names (Isaiah 52:6). The nation of Israel did not make His name known throughout the earth and do not even say His name out loud to this day, but yet Elohim wanted His name known throughout the earth and how can that be done if His name is not even used? We are told that He changes not (Malachi 3:6). Elohim is the eternal self-existent One, and His name is Yahuwah. I also switched “Lord” when used in connection to Jesus’ (Yahushua’s) name to “Master.” Otherwise I have used the King James Version throughout this book with those changes, except in a few places where other translations are used and are credited. It may be somewhat confusing at first, but as my wife and I have found, it becomes much more personal when using Elohim’s name and not His title. You begin to realize you are not just using a word, but you begin to have a sense of what those words mean. The Supreme Being – the eternal self-existent One - I AM. When we get to know someone intimately we usually talk to them using their names and not their titles. Many of us have not known Who we were worshipping because mankind has been complicit in keeping us from knowing them. It is my belief that Satan has had his hand in this in order that we would not comprehend Their names and what those names mean. And this eternal self-existent One has given us the means to know how to distinguish Him from all the other gods who claim our homage and worship and that exist in our world today. Elohim challenged the false gods whom the nation of Israel worshipped with these words: “Let them bring forth, and show us what shall happen: let them show the former things, what they be, that we may consider them, and know the latter end of them; or declare us things for to come. Show the things that are to come hereafter, that we may know that ye are gods; yea, do good, or do evil, that we may be dismayed, and behold it together” (Isaiah 41:22-23, emphasis added). Only Yahuwah (the eternal self-existent One) knows the end from the beginning (Isaiah 46:10), and it is He that can show us what is going to happen in the future before it occurs, and He has already done so in the prophetic books of Daniel and Revelation found in the Bible. When we attempt to contemplate to understand Yahuwah and His unique abilities, it is like our minds come back with “insufficient data.” “We have a more sure word of prophecy; whereunto ye do well that ye take heed, as unto a light that shineth in a dark place, until the day dawn, and the day star arise in your hearts” (2 Peter 1:20, emphasis added), and yet people tend to ignore the study of the prophecies. He has left it up to us to study those books in order to understand what is about to happen in this world, and He has promised to give us the “Spirit of truth to guide us into all the truth” and “show us things to come” (John 16:13). There are many false prophets in the world, who whenever things begin to heat up in the Middle East begin to foretell what is about to happen. Yet it never happens, and yet people still listen to them after they are shown to not be a prophet of Elohim. But what are these false prophets accomplishing? They are like the little boy who hollers “wolf, wolf” so often that when the real wolf comes along, the true warning will be ignored. The Devil is seeking to desensitize humanity so that we are unprepared to meet the crisis ahead. That is what Satan is accomplishing through his agents in the religious world, and now when the true message of Elohim for this time in earth’s history is to be given, the world will, for the most part, ignore it as just another false prediction. We are fighting a very deceptive foe in Satan and in Revelation 12:9 we are told he “deceives the whole world.” We are not to watch the news’ headlines in order to determine what is about to happen, but we are to be studying the prophecies of Daniel and Revelation in order to know what tomorrow’s headlines will say before they are ever written. If the god you are following and worshipping today cannot “show you what shall happen” or “declare to you things to come” or “show the things that are to come hereafter” then just maybe you are not worshipping Yahuwah Elohim because He declares that He is able to do all these things? (Isaiah 41:22-23). Many will contend that we all worship the same god, but this is just not true. Most worship false gods that Satan has given to this world in the lies and deceptions he is practicing upon humanity, and many worship Satan who is the god of this world (2 Corinthians 4:4). Beliefs and rituals of religions must not become our gods for they may change. In the near future religions will change and merge and consolidate in ways we never could have thought would happen. The Ecumenical Movement has been seeking to do this for many years now. Do not be deceived (Galatians 6:7). Your faith must be in Yahuwah Elohim and His Son, Yahushua (Revelation 14:4). They never change (Malachi 3:6). You are invited to “Come and see” and read for yourself the things that Yahuwah Elohim has foretold is to come upon the earth during the time of the end just before Yahushua Messiah returns and puts an end to what is taking place on the earth. As I have studied the prophecies of Daniel and the Apostle John over the last twenty-four years, I have come to realize that what Yahuwah has made known to me must be given to the world. The prophecies are the “light that shines in a dark place” to guide us safely through the “time of trouble such as never was since there was a nation” (Daniel 12:1). The note of warning sounds continuously in my ears, Go, Tell the World of Their Danger! “My bowels, my bowels! I am pained at my very heart; my heart makes a noise in me; I cannot hold my peace, because thou hast heard, O my soul, the sound of the trumpet, the alarm of war. Destruction upon destruction is cried; for the whole land is spoiled” (Jeremiah 4:19-20). When you discover what is pictured as about to happen in the seven trumpets of Revelation and the death and destruction which are to occur during the last days you can never look at life the same again! In Revelation 10:9-11, we read the following: “And I went to the angel, and said unto him, Give me the little book [the Bible]. And he said unto me, Take it, and eat it up [study it]; and it shall make thy belly bitter, but it shall be in thy mouth sweet as honey [understanding the truths of the Bible are indeed sweet and healing as is honey]. And I took the little book out of the angel’s hand, and ate it up; and it was in my mouth sweet as honey: and as soon as I had eaten it, my belly was bitter. And he said unto me, Thou must prophesy again before many peoples, and nations, and tongues, and kings” (emphasis added). Our Elohim has greatly honored me with making known to me the treasures that have been kept hidden for all these centuries in the prophecies of Daniel and Revelation as I studied them and in now giving me the opportunity of sharing with the world what He has shown me. As I said in the Prologue, five years ago I had a dream in which I was told to write a book. At the breakfast table that morning my wife, Sherry, told me I should write a book. Coincidence? I leave it to you to decide once you have read this book whether Yahuwah told me to write this book or not, and if what I have come to understand is correct. Time will tell. “Yahuwah bless you, and keep you: Yahuwah make His face shine upon you, and be gracious unto you: Yahuwah lift up His countenance upon you, and give you peace” (Numbers 6:24-26).